I spent two weeks making these costumes for the boys. Last night, Jonah told me that he's not allowed to wear a mask to school. AAAARRRGH!!! I guess a lot of schools are banning masks and scary make-up. One school district only wants the kids to go dressed as historical figures. Way to kill the fun. Those aren’t masks, they are long hats. Long hats, not being masks, are okay. Problem solved. I admit to a mask phobia that makes me glad that masks aren’t allowed at school. I used to hate them as a kid, too. They made it hard for me to see, and then, when I go the glasses, they were impossible. Our school bans masks & weapons. I never let the kids wear masks, anyway (to respect my phobia). But, the weapon issue came up this year, ’cause my son is Daniel Boone. He put the costume on and complained ’cause he wanted to have a weapon. I did admit that an authentic Boone would have had a gun. Our schools ban costumes. I’m 100% OK with this, but I do think it’s a little ridiculous that they justify this ban with the argument, “some of the costumes are dangerous.” Uh, what? I think it’s an indirect mask argument, but really: just say that dress-up isn’t happening in school. Enough with the lame attempt at justification. Lots of people are apparently anti-fun. Halloween seems to produce a queasy alliance between upper middle-class sanctimonious killjoys and weird Christian fundamentalist nutjobbery. I can’t blame principals for just ducking their heads and getting out of the way. The thing I find so weird about the “o noes someone wore a scary costume or mask in the school Halloween parade, won’t someone think of the childrens” is that if the impact of such costumes is so psychologically negative, how is it that we’ve survived two or three decades of costume-wearing of this kind with our social fabric intact? But that’s usually the problem when middle-class worriers focus their finger-wagging on some new anxiety. Cute costumes! I’m afraid to show E because he might want to be one next year. And I’m not crafty. I think one of the mask concern is really for safety of the person wearing the mask — they’re concerned that the kid won’t be able to see properly out of a mask. Another concern is that they want to be able to tell who the kids are, when they’re costumed. I suspect mask phobias only play a minor role. But, in Timothy’s who did we survive question, clearly the mask fear — as opposed to phobia — is something you’d get inured to if you saw masks a lot. Some would be frightened no matter how much exposure they had (me, for example, though I don’t become non-functional or anything, just unhappy). Others would have gotten over their initial discomfort. BTW, the costumes are cute, Laura, and clever. My girl is going as a hippy (or, as she would say, a historical character from the 60s). She pulled that costume together out of her clothes. My son is going as boone in a purchased costume from gymboree. I like clever home made costumes, though. Our school kind of avoids the whole thing by having a family dance the Saturday night before Halloween. That way kids that want to dress up can, parents that are offended by Halloween don’t come, and everyone is happy. Yep. Don’t forget the problem of kids getting too much into character. Costumes at school are bound to be very distracting, especially for fidgety, easily distractible kids. I think that a well-chaperoned 45 minute party at the end of the school day with costume wearing and cookie decorating/eating, is an OK compromise. My son is at school right now dressed as a knight. When I dropped him off, Batman, a Mutant Ninja Turtle, and Spiderman were already there. I would guess that it will be a long day for the teachers. God forbid that kids have a day where they get distracted by their imaginations, or where the hint of the carnivalesque might creep into the well-ordered regimen of a nicely managed middle-class life. I tend toward the Bettelheimian theory that a degree of circumscribed fear is psychologically healthy, myself. But I don’t suppose schools need to be the sponsors. Our school says “no violent costumes.” Good thing L decided to be a stegosaurus and not a T-Rex. She is roaring a lot today nevertheless. I’m not sure about “a day”. From right here, it looks like Halloween is turning into a week-long festival. There is ample time to exercise that imagination outside of school hours. Also, as MH points out, it’s rough on the teachers to deal with a class full of superheroes all day long. I’m still somewhat scarred by memories of the day that I had to do preschool co-op when someone had brought a police play set (hand-cuffs, gun, etc.) and a firefighter set to class. Snipped paper salads for a tiny dragon? Amy P, I’m in love with your kid. Yeah, the day is a total loss. At my kids’ school they don’t even pretend. The kids *bring* their costumes and change after lunch, and the whole afternoon is totally given over to parties. Maybe it is overcommercialized, etc., but at our house Halloween really helps ease the transition from “I can’t believe summer is over” to “here I am in the heart of the school year.” The costume thing — choosing, negotiating with your sister over who gets to be Hermione vs. Ginny, setting your budget, shopping or sewing — can fill several weeks. 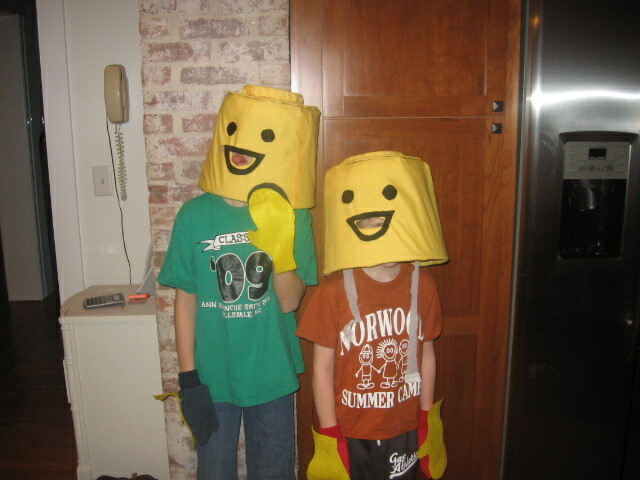 Once Halloween is over the costumes themselves transition seamlessly into the dress-up box for everyday play use. And voila, it’s November and everyone’s forgotten completely about how much they miss summer. I know the kindergarten kids here had a Halloween parade, but my kids didn’t go to school in costume (10yo will be Cyndi Lauper, 7yo will be Darth Vader). Probably the funniest thing I’ve seen all week was last night’s episode of Community (sitcom about unrealistic community college) where Abed was Batman (Christian Bale’s Batman) for Halloween. Abed is written as having Asperger’s, fwiw. It was truly hilarious. Go watch on Hulu. The show sounds good. How is it unrealistic? Not enough adjuncts? Speaking of TV, why has no one ever done a reality show featuring foreign exchange students and host families? Well, for one thing the main character is going back to community college to get his 4-year degree. In the pilot, he blackmailed a prof into getting him all the answers to all the questions on every exam. LOL! As if I ever write an exam more than a day in advance. On the other hand, the mix of students is realistic. And there was a sitcom about foreign exchange student and a host family: Aliens in America.